This article is about the former transit station in San Francisco, which closed in 2010. For its replacement, see Transbay Transit Center. The San Francisco Transbay Terminal or Transbay Terminal, was a transportation complex in San Francisco, California, United States, roughly in the center of the rectangle bounded north–south by Mission Street and Howard Street, and east–west by Beale Street and 2nd Street in the South of Market area of the city. It opened on January 14, 1939 as a train station and was converted into a bus depot in 1959. The terminal mainly served San Francisco's downtown and Financial District, as transportation from surrounding communities of the Bay Area terminated there such as: Golden Gate Transit buses from Marin County, AC Transit buses from the East Bay, and SamTrans buses from San Mateo County. Long-distance buses from beyond the Bay Area such as Greyhound and Amtrak also served the terminal. 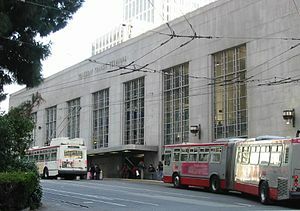 Several bus lines of the San Francisco Municipal Railway connected with the terminal. It closed on August 7, 2010, to make way for the construction of the replacement facility, the Transbay Transit Center, and associated towers. All long-distance and transbay bus operations were transferred to a Temporary Transbay Terminal at the nearby block bounded by Main, Folsom, Beale, and Howard Streets. The new Transbay Transit Center broke ground on August 11, 2010. US Secretary of Transportation Ray LaHood, US Speaker of the House Nancy Pelosi, and the Mayor of San Francisco Gavin Newsom attended the ceremony. The new transit center opened to the public on August 12, 2018. The Transbay Terminal served as the San Francisco terminus for the electric commuter trains of the Interurban Electric (Southern Pacific), the Key System and the Sacramento Northern (Western Pacific) railroads, which ran on the south side of the lower deck of the Bay Bridge. Bus services such as Greyhound and local Muni streetcar lines had stops at the main entrance. The Terminal was designed by Timothy L. Pflueger in the Art Moderne style. Bids were taken for construction of the terminal in June 1937, excavation began on 29 July 1937, and the first steel was erected on 12 January 1938. Structural concrete was complete by May 1938. The San Francisco-Oakland Bay Bridge Electric Railway Terminal Building was formally dedicated on January 14, 1939 (1939-01-14Tdmy). State Director of Public Works Frank W. Clark turned the facilities over to the State of California, as represented by Lieutenant Governor Ellis E. Patterson, who turned over management of the facility to the three electric railroad companies. State officials and guests rode electric trains to the opening ceremony. Construction of rail facilities (including laying tracks on the bridge and construction of the new San Francisco terminal) for the Bay Bridge had cost the state an estimated US$15,000,000 (equivalent to $270,200,000 in 2018), and the state had invested an additional US$3,666,129 (equivalent to $66,000,000 in 2018) in rolling stock, which was leased to the railroad companies. The terminal cost was estimated at US$2,300,000 (equivalent to $41,400,000 in 2018), and it was expected to serve upwards of 60,000 passengers per day. Governor Frank Merriam piloted the first (ceremonial) electric train across the bridge on 23 September 1938, although regular service did not commence until January 1939, after the terminal was complete. Trains were controlled with a custom electric switchboard, which was considerably simpler than the typical mechanical lever system then in use. A loop was built so trains could turn around and go back across the bridge. Even after rail service ended, the loop continued to be used by AC Transit, Thruway Motorcoach and Greyhound buses until the station closed. Surprisingly, a track was never made to connect to the Southern Pacific's Third and Townsend Depot so trains could go further south. There were six tracks. Beginning on January 15, 1939, half of all Market Street Railway trains were rerouted to a loop in front of the building; all services were eventually rerouted here in 1941. By November 1940, the Interurban Electric Company was seeking permission to abandon East Bay service, prompting Director Clark to consider proposals for the state to assume operation of trains across the bridge. The SP and Sacramento Northern trains ceased service across the Bay in 1941 only two years after the Terminal was completed. Interurban stated they were forced to discontinue service, citing falling passenger counts, revenues, and a failed proposed consolidation with the Key System. After Interurban was granted permission to discontinue service, Sacramento Northern also applied to discontinue service in 1941. Sacramento Northern carried only a minuscule fraction (less than 1%) of the total rail traffic over the Bay Bridge, which meant Sacramento Northern likely also operated at a loss. Trains carried 37,334,000 passengers across the Bay Bridge at peak ridership in 1945, driven in part by gasoline rationing, but ridership declined precipitously, managing to move only 6,113,000 passengers in 1957. The Key System successfully petitioned the Public Utilities Commission to discontinue service across the Bay Bridge in 1955 due to falling revenues, after failing to discontinue service in an unsuccessful 1953 petition. The Oakland City Planning Commission reported that since 1945, all the petitions from the Key System had invariably asked for cuts to service and increased fares, which also contributed to declining ridership. The last train crossed the bridge on April 20, 1958 (1958-04-20), less than twenty years after service was inaugurated in 1939, despite the vital role the trains played. There have been several attempts to restore rail service across the bridge (though not necessarily into the Transbay Terminal), but none have been successful. During the 1987 San Francisco Historic Trolley Festival, streetcar 578, formerly of Kobe, Japan, turns into the Transbay Terminal loop in scheduled service on the F-Market line. During the next year, the Transbay Terminal was rebuilt into a bus depot. The tracks were removed and replaced with pavement for use primarily by the buses of the publicly owned successor of the Key System, AC Transit. All lines were operating from the rebuilt terminal by 12 July 1959, and Greyhound service was added on 1 February 1960. In 1971 Amtrak started running buses into the Transbay Terminal from the Southern Pacific's 16th Street Station. Bus service thrived until late 1974, when BART's Transbay Tube opened. Many people preferred BART over AC Transit. The tube didn't run through the terminal, resulting in its decline. Homeless people noticed the dropping commuters and took the chance to inhabit it. After formation of the Muni Metro, streetcars were replaced with light rail vehicles and rerouted through the upper level of the Market Street Subway. Rail service to the station was briefly revived by the F Market line, at first during historic streetcar festivals, but for full service by 1995. The line's extension to Fisherman's Wharf in 2000 saw the end of rail traffic to the terminal. The Transbay Terminal hosted a cocktail lounge, a diner, a newsstand, and a state police office until the 1990s, when the tenants were either evicted or unable to meet safety regulations. Because the Terminal straddled First and Fremont streets, the large overpass structures and lobby spaces unofficially served to shelter numerous homeless people. Even after demolition commenced, several Transbay Terminal residents refused to move, preferring instead to sleep next to demolition debris. On January 30, 1986, four underground storage fuel tanks were excavated and removed from the 150 First Street site. Each of these tanks had a capacity of 1,000 gallons (Earth Metrics, 1989). Eight soil samples showed the existence of total petroleum hydrocarbons in levels ranging from 20 to 9,000 parts per million. On February 3, 1986, the excavation was backfilled. The City and County of San Francisco, the Alameda – Contra Costa Transit District (AC Transit), and the Peninsula Corridor Joint Powers Board (Caltrain) proposed[when?] to replace the underutilized original Transbay Terminal with an entirely new and more functional building at roughly the same location. The final Environmental Impact Report (EIR) was published in 2004, and construction began in August 2010 on Phase 1, the new Transbay Transit Center (TTC) building. A new outdoor temporary terminal was opened nearby to serve commuters during construction of the new transit center. The last bus departed the Transbay Terminal early on August 7, 2010 (2010-08-07), just after ownership of the building was transferred from Caltrans to TJPA. Demolition by wrecking ball commenced in December 2010, and demolition was declared complete on September 7, 2011 (2011-09-07). It was announced in March 2011 that a sculpture to be assembled from Transbay Terminal debris by Tim Hawkinson would be erected on the corner of Mission and Fremont Streets after completion of the new Transbay Transit Center. However, the sculpture project was cancelled on June 7, 2017 due to cost and engineering concerns. The Temporary Transbay Terminal is the current San Francisco terminus for Transbay and regional buses. It has been in operation from August 2010 through August 2018, and again from September 2018 to present. It occupies the city block bounded by Howard, Main, Folsom, and Beale Streets. The Temporary Transbay Terminal initially ceased operations on August 12, 2018, with the opening of the new Salesforce Transit Center, only to be reopened weeks later, on September 25, 2018, following the discovery of support beam cracks at the Salesforce Transit Center. By December 5, 2018, Clipper card kiosks were reinstalled at the temporary terminal due to the continued closure of the Transit Center. On April 2019, repairs were finished and it was determined that the cause of the cracking was partly caused when crews welding the beams together skipped a crucial step in the process required by the building code that led to tiny, micro-cracks forming. Multiple inspections failed to notice the skipped step, and those micro-cracks grew into larger ones. no opening date has yet been determined. ^ "San Francisco breaks ground on $4.2B Transbay Transit Center". Metro Magazine. 2010-08-12. ^ King, John (22 April 2010). "Plan for new Transbay Terminal in, under budget". San Francisco Chronicle. Retrieved 25 March 2016. ^ Nolte, Carl (25 July 2010). "Transbay Terminal finally going terminal". San Francisco Chronicle. Retrieved 25 March 2016. ^ Nyren, Ron (21 September 2015). "The Transformation of Transbay". Urbanland: The Magazine of the Urban Land Institute. Retrieved 25 March 2016. ^ "Bay Bridge Terminal Bids to be Opened". Berkeley Daily Gazette. 14 June 1937. Retrieved 24 March 2016. ^ a b c "Bay Bridge Terminal Dedicated" (PDF). California Highways and Public Works. California Department of Highways and Public Works. 17 (2): 6–9, 28. February 1939. Retrieved 24 March 2016. ^ "Building Bay Bridge Railroad" (PDF). California Highways and Public Works. California Department of Highways and Public Works. 16 (5): 8–11. May 1938. Retrieved 24 March 2016. ^ a b "Bridge Crossed by First Train". San Jose News. AP. 14 January 1939. Retrieved 24 March 2016. ^ a b "U.C. Man to Make Survey of Span Transport Lines". Berkeley Daily Gazette. 2 May 1941. Retrieved 24 March 2016. ^ "Opening of Rail Traffic on Bay Bridge Feted Saturday". Madera Tribune. 12 January 1939. ^ King, John (10 March 2011). "Huge sculpture to rise from debris of transit hub". San Francisco Chronicle. Retrieved 25 March 2016. ^ "Governor Merriam Pilots First Train Across Bay Bridge" (PDF). California Highways and Public Works. California Department of Highways and Public Works. 16 (10): 18–19. October 1938. Retrieved 24 March 2016. ^ "Bay Bridge Train Movements Controlled By Push Buttons" (PDF). California Highways and Public Works. California Department of Highways and Public Works. 16 (9): 24–25. September 1938. Retrieved 24 March 2016. ^ a b Callwell, Robert (September 1999). "Transit in San Francisco: A Selected Chronology, 1850-1995" (PDF). San Francisco Municipal Railway. ^ "State Operation of Bay Trains Urged". Berkeley Daily Gazette. UP. 18 November 1940. Retrieved 24 March 2016. ^ Johnson, Hal (26 February 1940). "S.P. Would Abandon Train Lines to S.F." Berkeley Daily Gazette. Retrieved 24 March 2016. President A.T. Mercier said: 'This action was made inevitable by circumstances beyond our control. ^ "Bay Bridge Traffic Declines in August". Berkeley Daily Gazette. UP. 30 September 1940. Retrieved 24 March 2016. ^ "Commuters Do Get Around Quite a Lot". Healdsburg Tribune, Enterprise and Scimitar. UP. 25 March 1940. Retrieved 24 March 2016. ^ a b c Raab, N.C. (July–August 1960). "Bay Bridge: First Phases of Reconstruction For Added Capacity Completed" (PDF). California Highways and Public Works. Division of Highways, California Department of Public Works. 39 (7–8): 35–42. Retrieved 24 March 2016. ^ Griffith, John; Holmes, Dallas (August 1967). "BART and the Victoria Line: A Comparison of New Commuter Transport in California and London". 55 (3). doi:10.15779/Z38K175. On July 24, 1953, a strike paralyzed Key System for seventy-six days. The California Public Utilities Commission refused to grant permission to Key System to abandon its train service on "A" and "B" transbay lines. [...] [In February 1954,] Key System applied to the Commission to cut services further. This was granted whereupon Key System announced that it conemplated still more curtailments and asked for tax relief of $188,000 per year. [...] In July , Key System served public notice that it intended to abandon all transbay trains and substitute coaches within one or two years. [...] In October , Key System was allowed by the Public Utilities Commission to curtail services on the East Bay motor coach lines and to increase fares [...] In January 1955, Key System applied to abandon all its rail services, and a rapid transit district was created in the East Bay to replace it. ^ "Remodeling of S.F. Transit Terminal Continues" (PDF). California Highways and Public Works. Division of Highways, California Department of Public Works. 39 (1–2): 59. January–February 1960. Retrieved 24 March 2016. The elevated track area from the San Francisco Anchorage which faces Beale Street in San Francisco, around the Terminal Loop, and through the building, has now been repaved and the 14 motor coach lines of the Key System Transit Lines are now operating out of the terminal, thus relieving the city streets of this traffic. [...] Included in this remodeling was the construction of a new stairway to the garage area below the street level, the installation of fluorescent lights in the main waiting room and on the mezzanine floor, the opening of various previously closed areas for freer movement of pedestrian traffic throughout the building, and the installing of a new stairway flanked on both sides by escalators, leading from the lobby to the mezzanine level. ^ Cabanatuan, Michael (30 July 2010). "Travel into the Transbay Terminal's past". San Francisco Chronicle. Retrieved 25 March 2016. ^ Coté, John (31 July 2010). "Mayor urges homeless to leave Transbay Terminal". San Francisco Chronicle. Retrieved 25 March 2016. ^ Fagan, Kevin (11 February 2011). "Transbay Terminal hurdle: hard-core homeless". San Francisco Chronicle. Retrieved 25 March 2016. ^ "Final EIS/IER Transbay Terminal/Caltrain Downtown Extension/Redevelopment Project". Transbay Transit Center. 15 June 2004. Retrieved 28 March 2016. ^ Cabanatuan, Michael (6 August 2010). "Crews to ready Transbay Terminal for demolition". San Francisco Chronicle. Retrieved 25 March 2016. ^ "Demolition of Transbay Terminal". San Francisco Chronicle. 3 December 2010. Retrieved 25 March 2016. ^ "Wrecking ball begins Transbay Terminal demolition". San Francisco Chronicle. 4 December 2010. Retrieved 25 March 2016. ^ Tyler, Carolyn (7 September 2011). "Demolition of old Transbay Terminal complete". ABC7 News. Retrieved 25 March 2016. ^ "New Sculpture by Tim Hawkinson to be Installed at the New Transbay Transit Center" (Press release). San Francisco Arts Commission. 10 March 2011. Retrieved 25 March 2016. ^ "Public Art: Tim Hawkinson". Transbay Transit Center. 2011. Retrieved 25 March 2016. ^ Saldaña, Cesar (8 June 2017). "S.F. Cancels Multimillion-Dollar Transbay Terminal Art Project". KQED. Retrieved 8 October 2017. ^ "How to get around during Salesforce Transit Center's temporary closure in San Francisco". San Francisco Chronicle. 2018-09-25. Retrieved 2018-09-25. ^ Matier & Ross (5 December 2018). "No date to fix SF transit terminal as Clipper kiosks return to temporary site". San Francisco Chronicle. Retrieved 8 December 2018. Wikimedia Commons has media related to San Francisco Transbay Terminal. Transbay Temporary Terminal website The temporary transbay terminal, operated 2010-2018. Carlsson, Chris (June 2011). "Transbay Terminal: Historical Essay". FoundSF. Retrieved 24 March 2016. Jue, Tim; Guerra, Vanessa (2 August 2010). "The end of an era: farewell to the Transbay Terminal". CaliforniaBeat. Retrieved 24 March 2016.